Arizona educator strike day 3 | Fight Back! 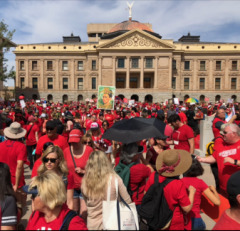 Phoenix, AZ - The historic statewide educator walkout entered its third day Monday, April 30. Tens of thousands filled the capitol once again in order to talk with legislators and pressure Governor Ducey to fully fund public schools. After Thursday’s monumental public demonstration of support with nearly 75,000 people at the capitol, Republicans shut down the Senate and left for the weekend. Where did they go? Many in the movement suspect they flew to Grand Rapids, Michigan for the ALEC Spring Summit. It is believed that many Arizona legislators who are ALEC members attended in order strategize how to defeat the walkout and #RedForEd. Monday also saw the arrival of American Federation of Teachers (AFT) President Randi Weingarten and other national union presidents. The capitol area is surrounded by educators under tents prepared for a long day and night in order to keep vigilant watch over how the legislature discusses and votes on funding. There is no apparent mood to end the walkout at this time.